TV | Fans like me who mourn the end of the popular British period drama Downton Abbey can rejoice as we turn our attention toward a new historical series, albeit one that focuses on the royal family several decades after the Crawleys' happy ending. With the 10-episode first season from Netflix released in its entirety this month, THE CROWN captures the early years of Queen Elizabeth II's reign, beginning with her marriage to Prince Philip in 1947. Offering an intimate look into the luxurious lifestyle of England's monarchy, we can imagine what HRH's life was really like behind closed doors. 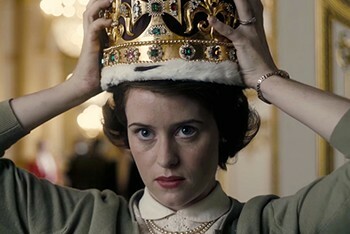 Already renewed for a second season, The Crown is set to include six seasons total, bringing us up to the present day with the now 90-year-old Queen Mother, the longest-reigning monarch in British history. 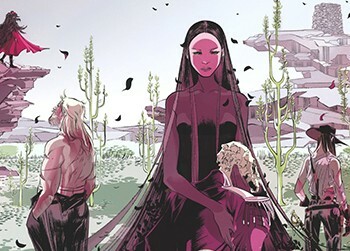 COMIC | Western and horror genres combine in the ongoing comic book series PRETTY DEADLY, now collected in two five-issue volumes; the second of which was released this past August. Written by Kelly Sue DeConnick with art by Emma Rios, the Eisner Award-nominated Pretty Deadly is as much of a feminist tribute — featuring two distinct female protagonists — as it is an examination of life, death, love and loss. In the first volume, we meet these women; Sissy is a young girl who travels around the dry and dusty landscape performing a staged show based on the lore of her narrative counterpart, Deathface Ginny, the daughter of a beautiful woman and Death himself. Managing to be dark and uplifting at the same time, Pretty Deadly creates new mythology inspired by lasting folklore.